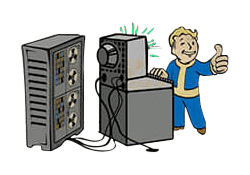 Hacker is a Perk in Fallout 4. It is associated with the Intelligence Stat. Rank 1:Knowledge of cutting-edge computer encryption allows you to hack advanced terminals. Rank 2: You can hack Expert terminals. Rank 3: You can hack Master terminals. Rank 4: When hacking, you never get locked out of a terminal when things go wrong.